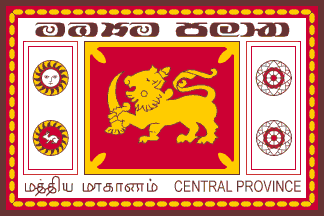 The lion is seen on the national flag of Sri Lanka- it's the lion of Vijaya, who was the first King in Sri Lanka- he arrived in 486 BC, so this has been a national symbol of the island for a long time- and it's been paired with the Sun and the Moon before as well, most notably by King Dutugemunu who fought off invaders from South India in 162 BC. The Central Province is, as you'd expect, in the middle of the country. It's mountainous and known for it's tea production- it's capital is Kandy, which was the center of the ancient kingdom of Kandy that was referenced on a couple of the other provincial flags that we've looked at during the BFC. Since, looking at our schedule, this is the last visit to Sri Lanka we'll be doing for awhile, I suppose it's only fair to drop a wee bit of trivia into the mix: Arthur C. Clarke emigrated to Sri Lanka in 1956 and ended up living out the rest of his life there- he's arguable one of Sri Lanka's most famous residents. Remember, until next time, keep your flags flying- FREAK or otherwise. We'll be off for a couple of weeks for Christmas and New Year's, but we'll be back at it in 2017.